Interlibrary loan service will be suspended December 6, 2018 through January 2, 2019. Service resumes January 3, 2019. The library will be open extended hours December 11-20. 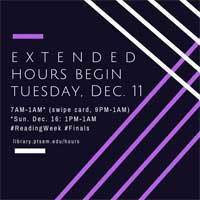 Some of those hours will be swipe card access only. Details are posted on the library hours page. Use of rooms in the library will be limited to Princeton Seminary students during the reading week/exam period, December 11-21.